If you spend any amount of time on the internet researching science and pseudoscience, you’ll find alarming claims about toxic or poisonous substances in our foods, vaccines, air, water, and so much else. And then you’ll find a lot of people (myself included) who try to present science-based evidence that there are no toxic vaccine chemicals. Generally, the pseudoscience argument proceeds along the lines of “this unpronounceable chemical is going to cause cancer.” Or there’s mercury in our vaccines that will cause autism. But what the science deniers are pushing is based on a lack of knowledge about how toxicology, or the study of the adverse effects of chemicals on living organisms, determines what is or isn’t toxic. In other words, if you’re speaking about substances in foods or vaccines or anything, the most important principle is that the dose makes the poison (or toxin). Everything that we consume or breathe is potentially toxic, but what is the most overriding principle must be the dose. This is one of the major issues with throwing around the term “toxic” or “poisonous” so freely. If you drink pure water that was ultra-purified and taken from an ancient aquifer uncontaminated by man’s activities, you might think you are drinking the least toxic substance ever. But once again, the dose makes the poison. Drink a few glasses, and you will be properly hydrated, and there’s probably nothing that’s going to happen to you (unless you’re doing so because of an underlying chronic disease, but let’s not digress). On the other hand, there is a condition called water intoxication, also known as water poisoning or dilutional hyponatremia. Essentially, if one drinks too much water, it causes a sudden imbalance between water and sodium (along with other cations) which leads to unconsciousness and even death. But again, there’s a point in between the amount of water in a few glasses and the amount of water to cause water poisoning – that is the toxic dose. But it’s more complicated than that. Some people have genetic or other adaptation to various compounds in the environment. Some toxic compounds can accumulate in certain tissues. Moreover, many compounds don’t stick around for a long period of time, being quickly cleared out of the blood through the kidneys. If you claim that there are toxic vaccine chemicals, are you considering all the physiological factors that make that chemical toxic or not? As I’ve said many times, the human organism is vigorous and powerful. We are not weaklings that have evolved to live in enclosed chambers with purified air, food and water. We actually evolved with a robust and highly adaptive immune system and detoxification system that allows us to survive with a widely varied diet and environment. Back to the dose makes the poison. One of the most important aspects of toxicity is that the size of the organism consuming the substance is critical. That’s why the toxic dose is almost always expressed as mg/kg weight (it also can be expressed in a volume amount for a liquid or gas per kg weight). So a fixed amount of a compound may be toxic to a 10 kg child, and safe to a 100 kg man, because the man can theoretically tolerate 10X more of the compound. Finally, and most importantly, toxicity does not necessarily mean death. A toxic dose may cause minor effects like bleeding or headache, or it could cause something more serious like depression or a cancer – of course, some dose might cause death (like water poisoning can). Generally, there is a clear transition in the dose from no effect to major effect (whether measuring efficacy or toxicity), there is usually not a point where it magically changes from non-poisonous to poisonous. The fundamental tool in toxicology is the dose-response relationship, a statistical measurement that describes the change in effect on an organism caused by different doses of a chemical (anything from drugs to foods to environmental contaminants) after a certain exposure time. For pharmaceuticals and almost any chemical, the dose-response relationship measures two key parameters – first, the proper dose that provides the most efficacy, and second, the dose that induces any toxic effects. Efficacy, in this case, means the effect that is claimed for the compound, so a new cancer drug needs to show at what dose it causes remission of the cancer, and for a new pesticide, how much is needed to cause the effect necessary. Some chemical compounds aren’t used for some biological effect, so we may just examine the toxicity. Dose-response relationships are amongst the earliest studies done on any new drug, pesticide, and many chemicals. Cancer drugs require highly advanced statistical analyses of dose-response, because sometimes the best dose for efficacy is just below the toxic level dose. This is because cancer cells are really just corrupted versions of your own cells, so what kills them could kill “normal” cells. Dr. Cami Ryan, who holds her doctorate in biotechnology and agriculture, designed a brilliant and colorful chart about the toxic dose of numerous “natural” and man-made chemicals. You will be surprised. First of all, “natural” compounds like nicotine, cyanide, vitamin D, and botulin (the favorite of wrinkle-removing plastic surgeons everywhere) are some of the most toxic and scary compounds on the planet. That’s why the appeal to nature is probably one of the most silly and illogical arguments that you can make. Look at caffeine – it’s “very toxic,” yet no one is telling you to stop drinking your coffee. An average cup of coffee contains 95 mg of caffeine, and the toxic dose is 192 mg/kg. For a 100kg man, it would take well over 200 cups of coffee, all at once, to get close to a toxic dose for that man. One more thing. That’s not a lifetime dose of 200 cups. The biological half life of caffeine is around 3-7 hours, and it would be mostly gone within 24 hours, just in time for your morning couple of cups of coffee. Toxicity itself doesn’t tell us the whole story about chemicals – there are actually two things to examine. First, it’s the dose response curve for toxicity and a similar curve for effectiveness. The margin of safety for any chemical, including the “toxic vaccine chemicals,” is the the difference between the doses. The effective dose has to be below the toxic dose. 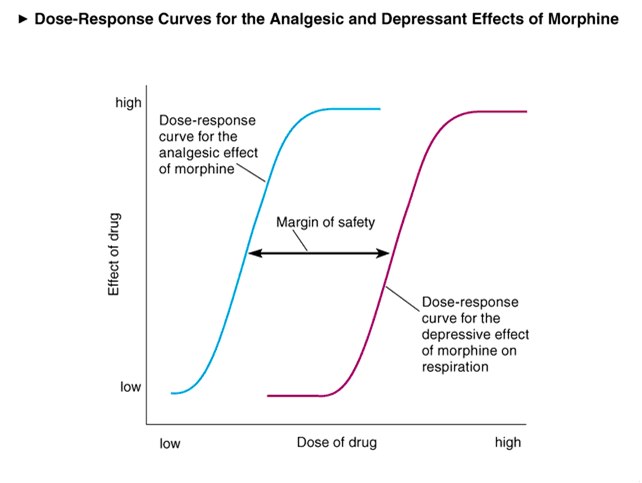 As you can see above, two curves are generated, the blue one measures the the effectiveness for a chemical like morphine, and the red one represents the toxicity. One can then determine how much of margin of safety there might be between the effective dose and a toxic dose. This matters in biology. Formaldehyde is one of those scary toxic vaccine chemicals that are at the forefront of several anti-vaccine tropes. This simple bio-organic molecule is used in the purification of the vaccine (the last thing we want is contamination from viruses or bacteria) – 99.9% of which is removed during the final steps of manufacturing. The package labeling for most vaccines do not include the amount of formaldehyde in the vaccines because it is so tiny, so minuscule, so veritably invisible, that the amount actually cannot be measured. It’s possible that there is actually no formaldehyde in solution, because it cannot be measured, but the chances are good there is some because the manufacturing process can’t dilute out the vaccine sufficiently to guarantee that every picogram (that’s one trillionth of a gram) is removed, because it would dilute the vaccine’s antigen too. So what can we conclude from all of this information? The normal blood level of formaldehyde is 2.74 +/- 0.14 mg/L. A normal child has a blood volume of 2-3 L, so a normal child has 5-9 mg of formaldehyde naturally floating in her blood. This level is about 1,000,000X more than found in a dose of vaccine. Is that math clear? It would take probably 10-20 million doses of vaccines to just slightly increase the formaldehyde level in your child. Once again, the simple math clearly shows that formaldehyde is not one of the toxic vaccine chemicals. According to the anti-vaccine crows, one of the worst of the toxic vaccine chemicals is thiomersal (or thimerosal), often just called “mercury” by those without a solid science education. I bet if you Google “toxic vaccine chemicals,” thiomersal will be in nearly every hit. Let’s make some points clear right now. This is NOT mercury in its elemental form, which you might remember from old-style medical thermometers. So there isn’t a pool of mercury in the vaccine vial. Moreover, thiomersal is ONLY used, at least in vaccines, in multi-use flu vaccine vials. Although there is no evidence that thiomersal has any effect at the vaccine dose level, manufacturers removed it from almost all vaccines. Thimerosal is a mercury atom with an attached thiolate and ethyl group. The thiolate group causes thiomersal to be water soluble (dissolves in water), whereas the ethyl group “protects” the body from the effects of the elemental mercury. In general, anti-vaccine types call ethylmercury just mercury, as if the vaccine contained a puddle of liquid mercury to be injected into a little baby. However, to call ethylmercury simply mercury would be like calling table salt, sodium chloride, chlorine. Yes, chlorine is a poisonous gas, but when it’s in the ionic form, chloride, it’s just an ion that gives flavor to food and helps maintain the balance of water and other ions in the blood. And yes, there is a toxic dose of table salt, but it has nothing to do with “chlorine” – it has everything to do with the ionic balance of the blood. Thiomersal is a toxic compound, there is no denying that – it kills bacteria. But let’s get back to toxicology of this chemical. But the math is even more telling. This flu vaccine, given once a year, has a maximum dose of 25 micrograms of ethylmercury (but not elemental mercury). According to an NIH database, the LD50, that is, the approximate dose at which 50% of organisms will die (in this case a mouse), is 98 mg/kg body weight, if delivered subcutaneously, generally how vaccines are delivered. A 20 kg child would get 25 micrograms of ethylmercury in one injection every year. The theoretical LD50 dose for that same child would be around 2000 mg of thiomersal, or about 80,000 times higher than the amount of thiomersal in one vaccine dose – of course, all childhood vaccines lack thimerosal. So, you would have to inject your child 80,000 times a day, every day, to make it potentially toxic. And no, dose-response relationships are not linear. That doesn’t mean that there’s some tiny risk of death from even a small dose of thiomersal. There is actually NO risk. And again, since there’s no thiomersal in pediatric vaccines, this argument is incredibly ridiculous. To call thiomersal one of the “toxic vaccine chemicals” is ridiculous and lacks scientific support. And here we go with the third member of the triumvirate of “toxic vaccine chemicals.” That chemical is aluminum. Part of the issue with aluminum is an oft-repeated myth that somehow aluminum is linked to a few neurodegenerative conditions, such as Alzheimer’s Disease. Like many myths out there in the wild, science doesn’t doesn’t support this belief. But let’s look at the math with respect to aluminum in vaccines. Aluminum, the third most common element on this planet, is used in vaccines as an adjuvant, which is a component that boosts the immune response to a vaccine. Adjuvants are employed to reduce the quantity and doses of vaccines necessary to induce an appropriate immune response. Not all vaccines use adjuvants or use aluminum as an adjuvant. 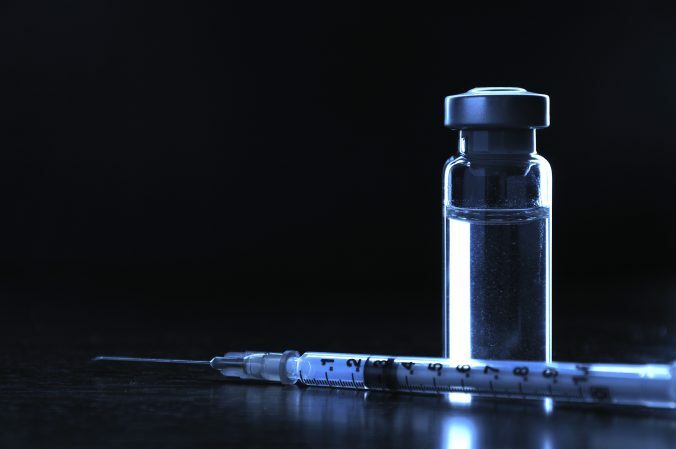 For example, live viral vaccines, such as MMR (measles, mumps and rubella), varicella (chickenpox) and rotavirus vaccines lack aluminum as an ingredient. Most other vaccines contain aluminum. But let’s see if this chemical is actually toxic. The amount of aluminum in vaccines vary from 0.125 mg to 1.5 mg per dose. Importantly, infants receive around 4.4 mg of aluminum during their first six months of vaccinations. But how does this compare to real world situations especially since aluminum is such a common element in the real world. Breast-fed infants ingest about 7 mg of aluminum during their first six months. Formula fed infants ingest about 38 mg. Soy formula fed infants ingest almost 117 mg of aluminum. In other words, infants get nearly 2-30X more aluminum from just food than from vaccines. The air itself has lots of aluminum. In a city, the air contains 0.4 – 8.0 µg (micrograms, or 0.001 mg) of aluminum per cubic meter of air. A baby inhales about 7.2 cubic meters of air every day, which means that they’re inhaling from 2.9 to 57.6 µg of aluminum every day. Thus, a baby may get from 1.1 to 10.5 mg aluminum just from breathing during their first six months of life, right around what you would expect from vaccines during that period of time. The US EPA (Environmental Protection Agency) has set the maximum dose for aluminum in water at 0.2 mg/L. After a few days of drinking water, a child would quickly exceed the amount of aluminum given in vaccines over a period of 6 months. There was no evidence that aluminum increases the risk for Alzheimer’s Disease, other neurodegenerative diseases, genetic damage or cancer. High levels of aluminum can cause a bone disorder in patients who are undergoing dialysis, but the amounts of aluminum in these patients are substantially higher than would ever be found in any vaccine. Blood levels of aluminum in these patients are over 10X higher than those found in normal blood. There were no clear associations between vaccinations using Al adjuvants and serious adverse events. There is no evidence that aluminum injected with a vaccine has a different effect on any organ compared to ingested or inhaled aluminum. So not only have we determined that vaccines provide less aluminum than what might be found in the environment, we can’t find any evidence that the aluminum in vaccines have anything to do with anything, but make the vaccine’s immune response better. For any particular chemical on this planet, whether naturally occurring or manufactured by humans, there is some level, called a dose, at which it is toxic. Even water has a toxic does. For those same chemicals, there is some level, also called a dose, at which it is effective. The proper dose that makes it effective should be way below the dose that makes it toxic. Toxic vaccine chemicals sound scary, but they are also far below the level that is considered toxic, sometimes by at least 6-7 orders of magnitude (slightly less simple math). One cannot consider any so-called chemical as being toxic, unless the dose is considered – once again, the dose makes the poison. Vaccine ingredients are thoroughly tested before being used. Inventing an issue with formaldehyde, thimerosal or aluminum, when the amounts are far below the toxic dose, and they have been tested despite not being at toxic levels, should drive away any worry a parent should have about these ingredients in vaccines. Willhite CC, Karyakina NA, Yokel RA, Yenugadhati N, Wisniewski TM, Arnold IM, Momoli F, Krewski D. Systematic review of potential health risks posed by pharmaceutical, occupational and consumer exposures to metallic and nanoscale aluminum, aluminum oxides, aluminum hydroxide and its soluble salts. Crit Rev Toxicol. 2014 Oct;44 Suppl 4:1-80. doi: 10.3109/10408444.2014.934439. Review. PubMed PMID: 25233067; PubMed Central PMCID: PMC4997813.